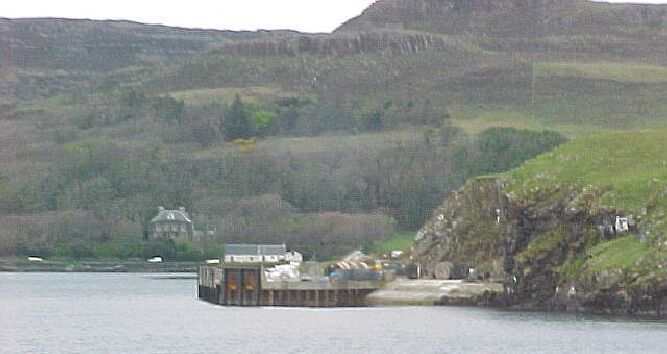 Canna is the most westerly of the group of islands known as the "Small Isles". The other islands in this group are Muck, Eigg and Rum. 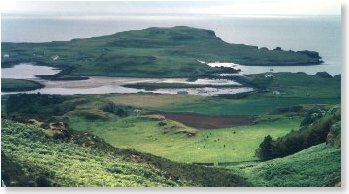 Canna has probably been inhabited for at least 5000 years (see appendix 2), but its earliest historical association is with Saint Columba (ca. 521-597 AD), patron saint of the island after whom two of its churches are named. 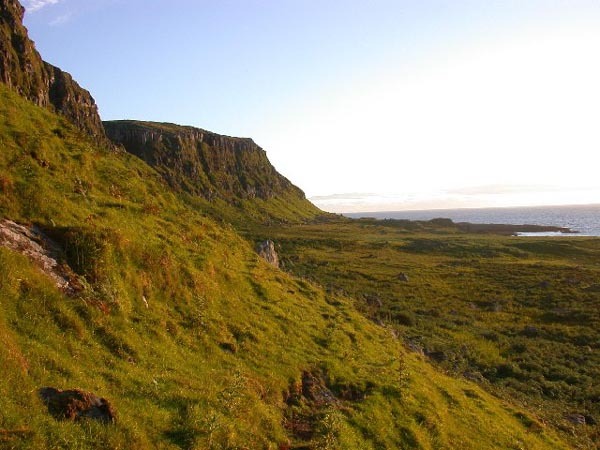 Some scholars have claimed that Canna was the 'Hinba' (see appendix 1) where Columba is said to have founded a monastery and received visitations of the Holy Spirit - some of which resulted in important political decisions for Scotland. There are traces of two early Christian sites on the island, at Keill (where the cross dates from the eighth- or ninth-century) and Sgorr nam Bàn Naomh. If the monastery was interrupted by Viking raids, it had resumed by the Middle Ages and continued at least until the fifteenth century. Canna remained technically the property of the Abbey of Iona until 1627. Like the rest of the Hebrides, Canna was affected by Norse settlement from (probably) the ninth century, and ultimately came under Norwegian suzerainty. This left its traces in place-names like Sanday and Tarbert and also the site traditionally known as 'Uamh Rìgh Lochlainn', the Viking King's grave (though there is no archaeological evidence that this is actually a burial). As Norse rule ended and the Lordship of the Isles emerged (C12th-C14th) Canna became part of the territory of Clanranald, a branch of the ruling MacDonald dynasty. Chiefs in those days literally had the power of life and death over their clan and, if we can believe the traditions which survive, theirs was not an easy jurisdiction to live under. They are represented as capricious and sometimes savage, acting like rather childish Mafiosi. Canna probably rarely saw them in person, except when acting as a halfway house between their lands in Moidart and South Uist. However, one of them died here in mysterious circumstances - it seems he was cursed by a priest! The tale of his death is full of strange omens and presentiments. Canna suffered at least once in a Clanranald feud, being laid waste in 1588 by a MacLean chief - apparently with the aid of a stray Spanish galleon. Later the Chiefs were among the staunchest supporters of the Stuart side during the Civil Wars, and embroiled their people along with them. They were prominent in Montrose's victories at Inverlochy and Kilsyth in 1645; a century later Canna men certainly enlisted with Bonnie Prince Charlie, whilst the island itself was subjected to reprisals by government troops. The failure of the rising brought changed times and by the early nineteenth century the Clanranalds, deeply in debt, had been forced to sell most of their lands including Canna. The island suddenly had to be made to pay, at a time when its population had peaked at over 400. The result was a series of clearances, with most of the population initially moved to poorer land on Sanday. Their plight was exacerbated by crop failures and the decline of the kelp industry; they were unable to support themselves, and a process of depopulation began which continued throughout the twentieth century. Most of the buildings in use today - although not the present croft houses on Sanday - were built between this time and the construction of the first pier in 1892. For a while Canna then became a herring-curing station; later, because of its central position in the Minch, it was an important haven for the ring-net fleets. The herring have now been obliterated, but it is still an occasional stopping-off point for fishing boats in the area. 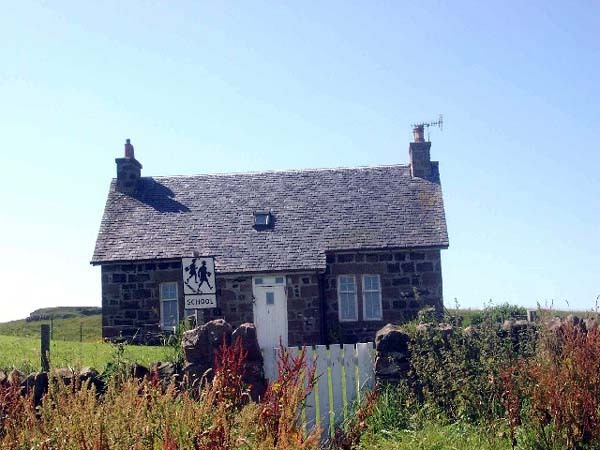 From 1938 to 1981 Canna was the property of noted Gaelic folklorists John Lorne Campbell and Margaret Fay Shaw Campbell. In 1981 they transferred ownership to the National Trust for Scotland. Mrs Campbell remained on the island, until she passed away in 2004, at Canna House, where there is a substantial archive of traditional Gaelic material gathered in the Hebrides. Today the main island is operated by the Trust as a single livestock farm, with conservation in mind and particularly the encouragement of rare species like corncrakes and sea eagles. Sanday is crofted by some of the inhabitants. Calmac Ferries - Calmac site giving general information plus timetables & fares of sailings to the Canna.